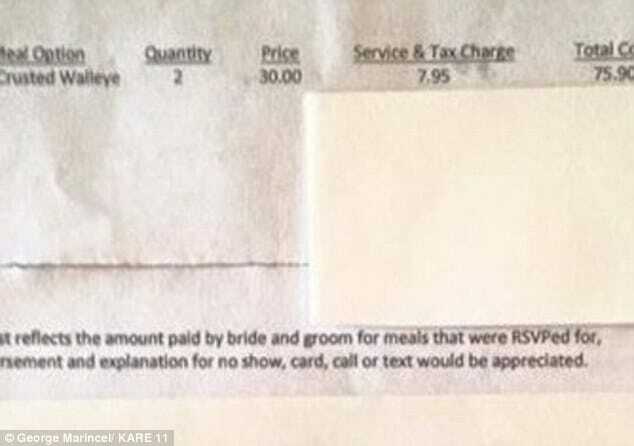 Minnesota woman Jessica Baker is outraged after receiving a dinner bill for $75 after canceling on her friend’s wedding day on the day of the ceremony. En route to the her friend’s wedding, Baker was forced at the last moment to cancel after receiving a call from her mother that she could no longer watch her children. Baker had asked her mother to take care of her kids on account that children were not allowed at the ceremony or reception. Thinking she had done right by letting the bride know that she wouldn’t be abel to make it on her big day, Baker was shocked when a few weeks later she received a $75 bill asking her to cover the cost of her and her husband’s missed meals. Standing her ground, Baker told she has no intention of paying the bill and to boot she has as of yet sent the couple a gift or card. What do you think kids? Could that have something to do with the sudden no show bill turning up? Or is Baking being taken to task for other unsaid/perceived grievances? Typical convention allows wedding guests up to a year to send a gift or card, and are expected to do so if they RSVP yes to a wedding. Sending a bill however is another thing. Common sense would dictate that the real world rarely corresponds to what we would expect to see in an ideal world, last minute inconveniences, catastrophes, guests even daring (imagine) bringing extra guests and other unforeseen instances that a well adjusted individual/bride or groom ought to reasonably know to expect. What do you think kids? Was the bride out of line to send Baker a bill? Was Baker out of line to not follow up with a note or a card after canceling at the last minute at her friend’s big day and perhaps failing to appreciate the demands, strains and financial obligation of putting on a wedding? I think its was terrible that she couldn’t attend but I think that it’s ludicrous that the bride would ask for money to be paid for a meal please talk about ghetto!